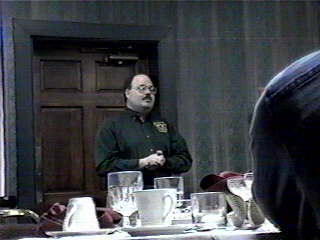 The Pa. Game commission hosted the House of Representatives Game and Fisheries Committee to a dinner, bear Management Presentation by Mark Ternent (head of the bear managemnt program), on Thursday evening March 18th just outside of Lewistown,Pa. 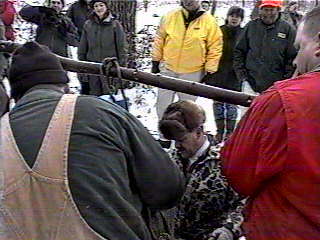 The following morning they were also invited to travel to a location in Mifflin County where the local WCO and the PGC had been informed of a bear den that contained a female bear with at least one cub by a logger that discovery the den while logging that area of the state forest. The logging operation was stopped, for several reasons including the weather and the fact of the bear den. I was fortunate enough to be invited to attend this event. I will try to report as much of the trip as possible to you. I would like to apologize to anyone I forgot and to those I did not remember a last name . 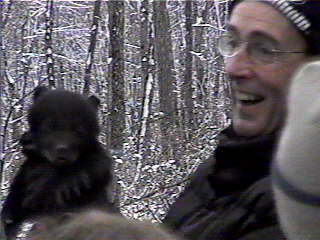 And many more that I did not have a chance to meet including wives- husbands-and children...but I am sure we all shared a wonderful experience..
Mark gave a wonderful presentation about our Pa. Black Bears, He included charts, graphs, and photos to add to his presentation. He made himself available for questions during and after the presentation. The presentation was enjoyed by all and everyone present learned somethng about our Black Bears. 600-700 bears are tagged annually. Each area depending on estimated populations and previous harvest are assigned so many bears to tag. 20% of the bears harvested have been tagged. 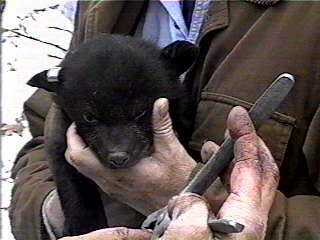 Tagging helps to determine the populations as well as identify certain bears. Each bear, when tagged, gets a tag in each ear, so just because you may see a bear that has two tags does not mean he was tagged at two different times.. Some bears are collared and some get an additonal tattoo in their mouth. The mother we saw was tattooed but not collared. 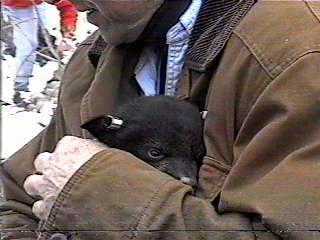 Collared females are often useful when an orphaned cub is discovered. 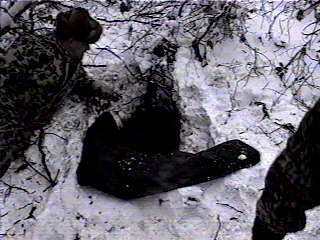 By using the collar they can locate the bear and if she has cubs they can attempt to add the orphan to the litter. The PGC has been very successful in this. Pa also leads the nation in the number of cubs in a litter, our average is 2 with 5 being the second most common number of cubs, about 20 % have 5. 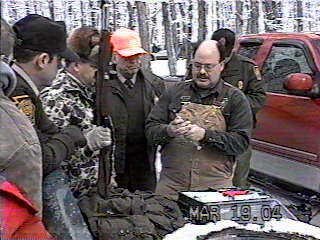 50 counties harvested bear last seson. Cubs stay with mother for 18 months and will den with her the second winter. After breeding males will leave the area and not return which helps prevent "in-breedng"
Mothers will "RUN OFF" their young the second summer so they can breed again. Our females breed every two years. The basic habitat of Pa is just great for black bears and that is why they are doing so well in our state. A couple sources we have are acorns and all types of berries. Females usually do not re-use the same den after giving birth to a litter in that den. The beginning of July is mating season. It is a good time to see bears on the move all day long, but also a time to use caution, because it is mating season. It is not uncommon in Pa for the cubs to outweigh the mother in the fall, especially males which are bigger to begin with. After the Bear presentation we were given instructions about the following morning's (Friday) agenda. Then we were free to "socialize". I spent most of the evening talking with Melody, Jennifer, her parents and sister, the honorable Tim Soloby from Washington County, and was later joined by the chairman of the committee Bruce Smith. I must admit the ladies really impressed me with their love and knowlege of the hunting sports. Both "Reps" were also nice and informative. We left the hotel after a wonderful Breakfast Buffet, and headed to bear country at about 8:30am. 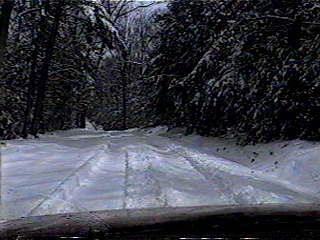 We awoke to about 12 inches of fresh snow on the top of the mountain where we were going.. Here Mark is preparing the darts to help "relax" the mother. The mixture is of a form where no matter what the mother's weight it will not harm her. The rifle is used as a back up, in case the mother were to get frightened as the team approached the den and ran off.. they would dart her with the rifle. So she would not abandon the cub or cubs in the den. Today Mark actually reached down into the den and darted the mother with a pistol. The gentleman in the middle with the orange hat is Don Parr..PGC South Central Regional Director whom I enjoyed converations with over dinner Thursday evening. Very pleasant and again, a well informed man. While Mark and his team did the actual "relaxing" of the mother the group waitng about 500 yards away and listened to gentlemen from the DCNR explain about the forest, habitat and the deer exclosures we are familar with. The den was inside such an exclosure. The bear needed two doses to relax, and it takes about 20-25 minutes to take effect, with each dose.. So while we contiued to wait the "merger issue" was settled with a snowball battle.... not really..
Basically a small hole under a brush pile. It looked to be impossible for the mother to turn around in the small area she was laying in. Snow and dirt were removed to actually make the opening as large as it is. The tarp in the front is used to carry the mother to an area close by for tagging etc. 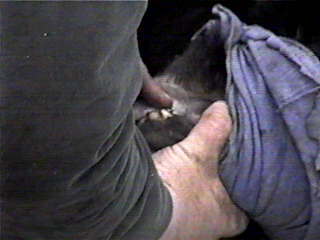 Here he is placing one of the two ear tags on the mother. The blue mask is to help keep the mother calm. She is NOT unconscious, just "supper relaxed"
And he said the mask ,by making "mom" unable to see any movement is more calming and relaxing and causes much less stress on the mother later. 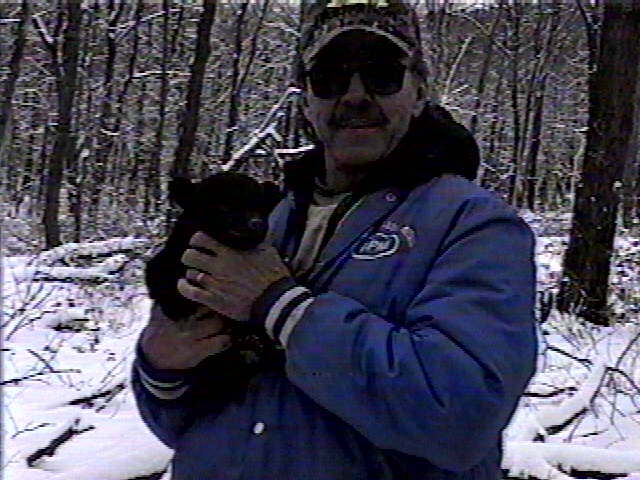 He estimates this bear at 3 years old and the male cub is her first litter. So in the fall she was over 200 lbs. One in each ear ....like momma got..
then momma and baby are returned to the den. During "my photo session" Mark tattooed the momma, so I missed that..
that was not as easy as getting her out.. but patience and a little struggling finally got the job done. The remainder of the group then quietly left the area.